New York City may be at the top of its game when it comes to energy efficiency and working toward a greener future, but there is one crucial area where the Big Apple seriously lags behind: recycling. Legislation was passed last year to overhaul the city’s recycling laws passed way back in 1989, but exactly how far behind are we? Only half of the 14 million tons of waste we generate every year is recycled, and earlier this year, the NRDC found that while more than two dozen large and medium sized U.S. cities recycle all types of plastic containers, New York only recycles bottles and jugs. In a different study, this time by Siemens AG, found that New York ranked 16th out of 27 cities in efficiently handling its waste. One of the biggest culprits is take-out containers and disposable utensils, ubiquitous among the working lunch crowd. While many cities require compostable containers and special bins to put them in, NYC has no such rule. Many cities even offer curbside compost collection and free recycling collection, but charge by weight for trash pick-up. And NYC isn’t just lagging behind — we’re actually moving backwards. Our recycling rate for waste picke up by the Sanitation Department is just 15 percent. That’s down from 23 percent in 2001. So with our Mayor installing renewable energy, adding electric vehicles to the city’s fleet, and tackling ancient oil boilers, what’s the problem? Some say a lack of commitment by our city government, others say the issue is simply not getting the attention it deserves. But officials say we are working on changing this glaring problem. Caswell Holloway, Mr. Bloomberg’s new deputy mayor for operations and a former commissioner of the city’s Department of Environmental Protection, told the New York Times that the city has enter into two new longterm contracts and is building new recycling infrastructure, like the 100,000 square foot recycling plant at the South Brooklyn Marine Terminal in Sunset Park. Our recycling laws may be weak, but they aren’t solely to blame. New Yorkers’ behavior plays a large part. Overall, NYC recycles about half of the 14 million pounds of waste it produces every year, but about half of that comes from the construction and demolition industry. The other, not-so-efficient half comes from businesses, commercial buildings, and residences, where less than half of the waste is properly sorted. This means that people are just throwing everything in the trash bin rather than putting recyclables where they belong. Several factors contribute to this, including confusing recycling rules and a lack of public recycling bins. Give that NYC has the heaviest foot traffic in the country, there are 25,000 waste bins on our streets, but there are only a measly 500 recycling bins. Plastics are just one part of it. Paper and food scraps, the largest single component of residential waste, have a whole set of problems, too. (Mireya Navarro details all these issues over at the New York Times). New York City may have been ranked the third greenest city in North America, but when you take a closer look at our waste management, it’s almost hard to see why. Recycling has long been seen as one of the easiest ways to green your life, so if New York City can’t get a better handle on it, that doesn’t bode well for our future. 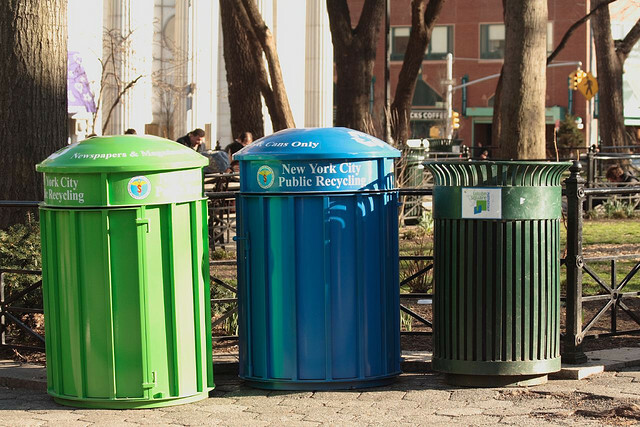 New York City may be at the top of its game when it comes to energy efficiency and working toward a greener future, but there is one crucial area where the Big Apple seriously lags behind: recycling. Legislation was passed last year to overhaul the city's recycling laws passed way back in 1989, but exactly how far behind are we? Only half of the 14 million tons of waste we generate every year is recycled, and earlier this year, the NRDC found that while more than two dozen large and medium sized U.S. cities recycle all types of plastic containers, New York only recycles bottles and jugs. In a different study, this time by Siemens AG, found that New York ranked 16th out of 27 cities in efficiently handling its waste. One of the biggest culprits is take-out containers and disposable utensils, ubiquitous among the working lunch crowd.